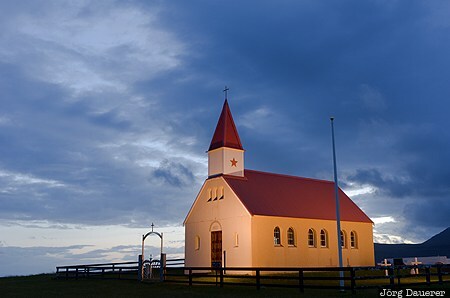 The small flood-lit church of Brimilsvellir on the Snæfellsnes Peninsula at the blue hour just before sunrise below a cloudy sky. Brimilsvellir is in Vesturland in the west of Iceland. This photo was taken in the morning of a cloudy day in September of 2013. This photo was taken with a digital camera.